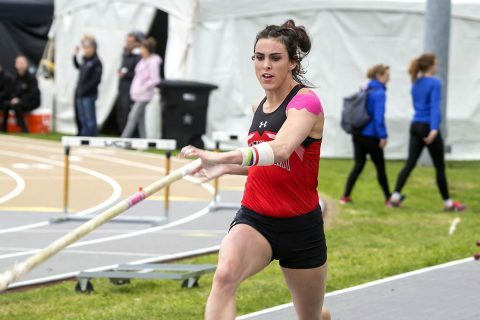 In addition to maintaining her stranglehold on the top spot in the conference standings, Amato zoomed all the way up to a tie for sixth in the NCAA East Region and 11th in the nation; the top-48 in each region advance to the Preliminary Round, with the top 12 in both the East and West Preliminaries advancing to the National Championships. No athlete in NCAA history with a mark as high as Amato’s has failed to reach the Regional level, and she may have company this year. Both junior Dascha Hix and freshman Morgan Bradley reached 3.87m (12-8.25), moving into the region’s top-48 and not only giving themselves a chance at regional qualification, but giving Austin Peay a very real shot at sweeping the podium next month at the OVC Outdoor Championships in Cookeville. For both Hix and Bradley, Saturday’s efforts represented their career-best marks. “Great night at WKU,” said Austin Peay head coach Doug Molnar. “Those three put together a complete effort. Morgan got Dascha and Savannah fired up with her PR and they fed off that all evening. A small cadre of runners represented Austin Peay at the Kentucky Wesleyan Twilight Invitational, with Keleah Shell (2:30.79) posting runner-up honors in the 800m run, closely followed by teammates Sophia Wilson (2:35.41, fourth) and Alura Endres (2:36.13, fifth). Austin Peay returns to Fortera Stadium for the annual APSU Invitational next weekend, with the two-day event set to kick off 5:00pm, Friday.